lubuntu is a faster, more lightweight and energy saving variant of Ubuntu using LXDE, the Lightweight X11 Desktop Environment. If you already have Ubuntu installed, trying lubuntu is really easy; just run "sudo apt-get install lubuntu-desktop". In summary, it's very pretty, super fast, and crazy small. In fact, its memory usage was almost laughable considering I was running it on a 4GB MacBook Pro. I think my total memory usage was something in the 200-300MB range. The biggest challenge for me was that lubuntu doesn't know about encrypted home directories. I have an encrypted home directory, and Ubuntu knows that it has to run ecryptfs-mount-private when I log in; in fact, it doesn't even need to ask me for my password again since it does it as part of the login process. When I ran lubuntu, I had to log in, run ecryptfs-mount-private (typing in my password again), log out, and then log back in. I have a couple more tips. To access the OpenBox menus, middle click on the desktop. If you decide to install lubuntu, don't tell it to switch to lxdm. Otherwise, if you remove lubuntu, you'll end up with a borked gdm setup. To fix it, you'll need to remove and reinstall gdm. 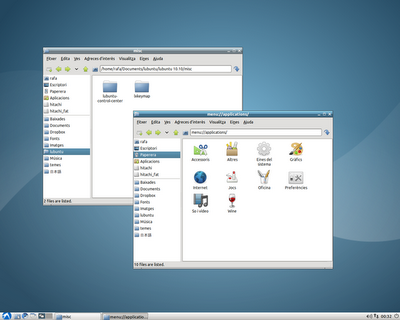 In summary, I really like lubuntu. It makes my machine feel lightning fast, faster than any other computer I've ever owned--at least until I fire up NetBeans ;) I'm not sure if they'll fix the things I mentioned, but if those things don't affect you, I think lubuntu is worth a try. I've been wondering about the caps lock issue as well. I'd like it to act as the Super key by default which is easy to do in Ubuntu, but Lubuntu's lxinput GUI doesn't support that. Personal: Should I Leave LinkedIn?